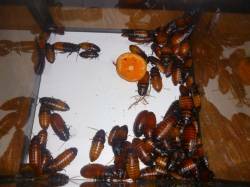 Description: Have around 60 hissers left for sale, most are mature adults. Take all for $50!!!!!!!!!! Pluss shipping usps priority. cost of shipping depends on your location. Shoot me a pm or email me at frogssnakes@yahoo.com I am also willing to ship smaller quanities, minimum of 20 ($20 pluss shipping) per order. Keywords: Madagascar hissing roaches for sale.